Two-point conversion strategy: The late-game scenario in which going for two is always the right move, and the NFL coaches who refuse to do it. There’s a late-game scenario in which going for two is always the right move. Why don’t NFL coaches ever do it? 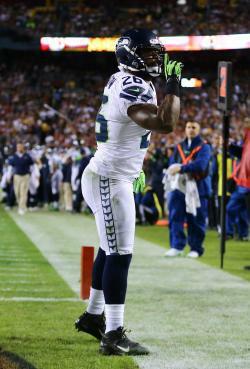 Michael Robinson celebrates his second quarter touchdown against the Washington Redskins during the NFC wild card game last weekend. On Dec. 23, the 8-6 Dallas Cowboys trailed the New Orleans Saints 31-17 late in the fourth quarter. Dallas’ path to victory seemed obvious: score two quick touchdowns and kick two extra points, then win the game in overtime. The first half of the plan worked perfectly. The Cowboys scored a touchdown and added the PAT with 3:35 left, then got another TD and PAT with 15 seconds to go. In overtime, however, the Saints forced Tony Romo’s crew to punt, then drove for the winning field goal. That’s how it goes in the NFL—sometimes you do everything right and the luck doesn’t go your way. Well, that’s likely how the Cowboys saw it. But in reality, Dallas fouled up the end game, succumbing to a fallacy that statisticians have recognized for going on five decades but NFL coaches have yet to comprehend. In a game they were desperate to win, the playoff-hungry Cowboys bowed to gridiron conventional wisdom and played for a tie. When his team scored that late touchdown to cut the lead to eight, head coach Jason Garrett should’ve made a call that seems radical only because nobody’s smart enough to do it. He should have gone for two. If two-pointers are a 48 percent proposition, then the expected value of going for two is 0.48 * 2 = 0.96 points. That means that in the long run, the close-to-a-sure-thing extra point is the better percentage move. But as this chart shows, it’s sometimes smart to go for two. Many of these cases are intuitive. If you’re down eight with three seconds to go, you need a touchdown and a two-point conversion to tie the game. And if you’re trailing by 11 with a minute left, it’s wise to get a touchdown plus two to reduce the margin to a field goal. Going for two when you’re down by two touchdowns is less obvious but no less logical. Let’s stipulate that our hypothetical team—we’ll call them the Cowboys—does score the required touchdowns in the waning minutes while keeping the opposition off the scoreboard, because otherwise this exercise is pointless. In that case, the touchdown + extra point + touchdown + extra point approach will lead to a victory 50 percent of the time—the game will be tied at the end of regulation, and we’ll assume the Cowboys and their opponent have an equal chance of winning in overtime (and we’ll ignore the possibility of a rare-for-the-NFL tie game). 52.1 percent of the time, the Cowboys miss the two-point conversion. In that instance, they’re trailing by eight points. After the second touchdown, they’ll have a 47.9 percent chance of converting the two-pointer to force overtime, and will then win in OT half the time. The Cowboys’ win probability in this case: 0.521 * 0.479 * 0.5 = 12.5 percent. 47.9 percent of the time, the Cowboys make the two-point conversion. In that case, they’ll trail by six. After the second touchdown, they kick the extra point and win the game. The win probability in this case: 0.479 * 1 = 47.9 percent. Add those two possible paths together, and the total win probability for the alternate-universe Cowboys is 12.5 + 47.9 = 60.4 percent. The difference between the win probability for the right decision (60.4 percent) and the wrong one (50 percent) is significant but not enormous. Kicking the extra point in this situation isn’t nearly as dumb, then, as Ron Rivera’s much-derided late-game punt in Week 4. But the choice is still clear: Going for two takes a 50-50 proposition and makes it a winning strategy. Despite the unanimity of the quants, NFL coaches are unmoved. According to the fantastically useful Pro Football Reference Play Finder, there were 12 separate NFL games this season (including Cowboys-Saints) in which a team scored a touchdown with less than six minutes on the clock to reduce its deficit to eight points. None of those 12 teams dared to go for two. In fact, if the Play Finder is correct, there has been just one instance since 2000 in which an NFL team took the mathematically correct, go-for-two-when-down-14 approach. On Oct. 14, 2001, the Baltimore Ravens trailed the Green Bay Packers 31-10 late in the fourth quarter. The Ravens scored a touchdown with 2:56 left to close to 31-17, recovered an onside kick, then scored again with 38 seconds to go. This time, Baltimore coach Brian Billick eschewed the extra point. Randall Cunningham’s two-point pass fell incomplete, though, and the Ravens’ follow-up onside kick failed. The Packers held on to win 31-23. In a Baltimore Sun story a few days later, Billick explained that he wanted to “let the next score give you a chance.” The implication: He made the unconventional go-for-two move because he believed his exhausted team would be worse than an even bet in overtime. In his 2000 paper, Sackrowitz cites a similar case from 1999 in which Detroit Lions coach Bobby Ross went for two with his team trailing 23-19 in the back half of the fourth quarter. “We didn’t want to go into overtime—not with three games in 11 days and as banged-up on special teams as we were,” Ross explained. As in the Ravens-Packers game, this shows that a coach’s end-game calculus may change if he doesn’t believe (as we’ve been assuming) that overtime will be a 50-50 proposition. Even so, the huge disparity in the backlash to Billick and Ross reflects that football fans and football coaches confuse outcome with process. The PAT-kicking Cowboys should not be chided because they lost to the Saints in overtime. Rather, they deserve criticism for deploying a strategy that reduced their chances of winning. So, let me also censure Gary Kubiak and the Houston Texans for their behavior against the Jacksonville Jaguars on Nov. 18. In that game, the Texans pulled within 34-26 with 5:39 to go, kicked the extra point, tied the game on another TD and extra point with 1:34 remaining, then won the game in overtime. The Texans got the right outcome from the wrong process. Shame on you, Houston. My correspondent Walter Sun suggests there’s a simple way to get risk-averse, play-not-to-lose coaches to come around to the right way of thinking. “If you go for two when down eight, you not only improve your win probability (the sound mathematical reason), you also control your own fate (the reason fans/management will accept),” Sun says. Even in the age of the NFL’s new, fairer overtime system, the team that wins the OT coin toss still holds the advantage. “In a sport where the phrase ‘controlling your own destiny’ is overused,” Sun continues, this is the one time the cliché makes sense. Come on, NFL coaches—do you really want your fate to depend on whether a coin comes up heads?